With a cork closure, this wine has benefited from time spent bottle aging. In general, red wines benefit the most from long term aging, as the tannins of the wine join together to form “long chains”. Those "long chains" are what smooths out the wine and gives it a silkier mouthfeel that only an aged red can have! Upon tasting this wine from the library, we thoroughly enjoyed it and hope you do too – we only release 4 cases, so get it before it’s gone forever! 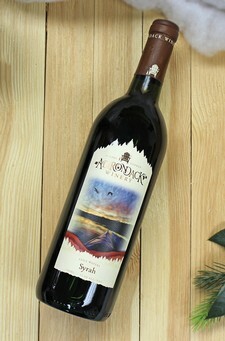 Fruit forward at the start, our Syrah is smooth and luscious. Flavors of dark berry combine with subtle oak, to create light tones of caramel, chocolate, black pepper & a balanced tannic finish. Syrah pairs well with smoky barbecue foods, burgers, steak, lamb, and spicy dishes. Sharp cheeses and dark chocolate desserts make an excellent match, too! Label Image: Kayaks navigate the still evening waters of Lake George.